To that end, the DNR will be adding mats with disinfection solution that people will walk across after leaving the caves to decrease the potential of spreading the fungus to other caves and bat populations. People who have recently visited other caves will also walk across the disinfection mats prior to going into Maquoketa Caves. Maquoketa Caves were closed for two years because of concerns about white-nose syndrome and the approximately 400 bats that hibernate there in the winter. The caves were reopened this spring because the DNR was able to have staff available to educate the public about precautions needed to prevent spreading of the disease. “We were fortunate in that the Legislature appropriated enough money for us to be able to offer this kind of service to the public. We simply didn’t have the funding the previous two years to be able to do this,” said Szcodronski. 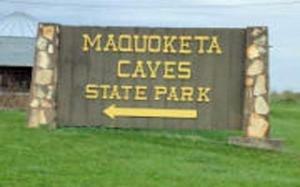 Szcodronski said one of the primary messages to visitors at Maquoketa Caves is to not visit other caves with any clothing or gear that was used there. Howell said options are being looked at to increase sampling at Maquoketa Caves next winter because healthy bat populations are important both ecologically and economically. Many species of bats feed voraciously on insects resulting in an estimated $3 billion of savings to the U.S. agriculture industry each year by providing pest control, according to a 2011 article in Science Magazine. White-nose syndrome is known to be transmitted primarily from bat to bat, but fungal spores may be inadvertently carried to caves by humans on clothing and caving gear. The syndrome is not known to pose a threat to humans, pets or livestock.